Encounter Difficulty Calculator - New! RPG Villain Generator - New! 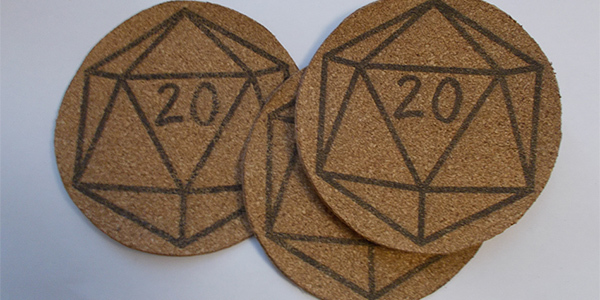 Cork coasters are a cheap and fun way to add a unique twist to your table, and thus to a tabletop gaming session. It can be a little tricky, depending on how complex you wish to get, but it definitely doesn't have to be, as you'll see in this guide. Parental guidance: Use of scissors, and use of a printer. Optional materials: Inkjet printer or drawing materials, glue, freezer paper, brush, varnish. The first thing you'll need is a design you wish to put on your coaster. 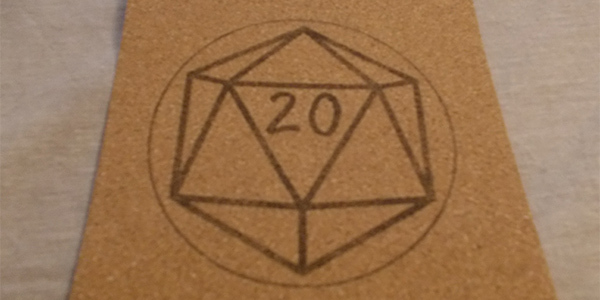 I used a simple d20 dice for this guide, but you can use any design you wish. Do note that the more complex the design, the higher the risk of mistakes or smudges. 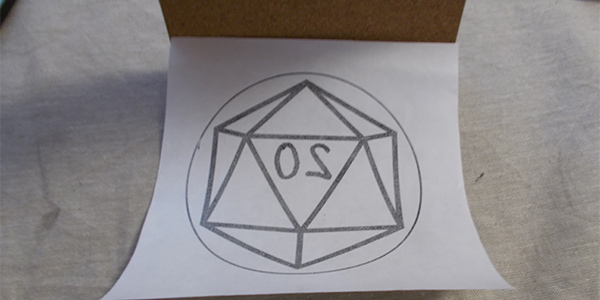 Once you have a design, add an outline of the shape of coaster you wish. I used a circle, but you could use any shape. These'll act as lines you cut along later. Then mirror the image. This is very important, the image will be mirrored again when you transfer it. Get your freezer paper, cut out an A4 size sheet (or a smaller size), tape it with the glossy side upward to an a4 piece of paper (or whatever the size of your freezer paper is), then print the design on this freezer paper (the higher the quality in the settings the better). Depending on your printer you might be able to skip this step, but you don't really want to risk getting freezer paper tangled inside. The ink will stay on top of the freezer paper, rather than soak into it like normal paper. So when you put something on top of the paper, in this case the cork, the ink will soak into that instead. There are alternatives to freezer paper, but I delve into that down below. Also note that you absolutely must use an inkjet printer. Laser printers don't use ink, so there's nothing for the cork to soak up. If your cork sheet is thin enough, and if your printer allows it, you may be able to print directly onto the cork, but check your printer manual first to see if it allows for such thickness. Once you have your printed design on the freezer paper, get your cork sheets, gently lower it on top of the freezer paper, put some weight on it (anything works, a carton of milk, a bag of sugar, etc. ), and just let it rest for a while. The ink from the freezer paper will soak into the cork, and in doing so will transfer the design onto the cork. The ink should soak into the cork pretty quickly, but I'd leave it for at least 5 minutes, just to be safe. Gently lift the cork to remove it, but try to avoid shifting the cork or freezer paper. There's usually still ink left on the freezer paper, so shifting things can cause minor smudges. You'll now have a design with an outline on a sheet of cork. Simply cut it out, and you're done. The freezer paper can then be wiped clean, and reused again. 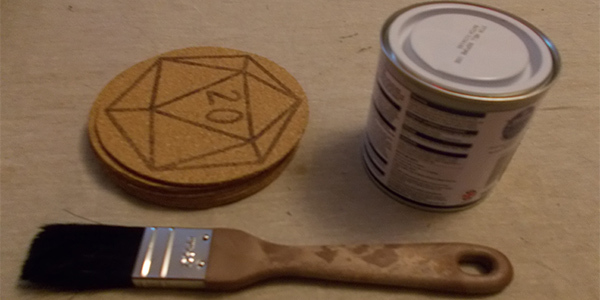 If you want to protect your coasters further, you can add a layer of varnish. Simply apply a layer of varnish with a soft brush, and you're done. Depending on the thickness of your cork the varnish might cause your coasters to curl up. Applying a layer of varnish on the other side will help prevent this. Depending on your design you may also wish to use a varnish spray, rather than a brush. Otherwise you might smudge parts of the ink, especially on designs with very thick, inky lines. There are alternatives to freezer paper, but in my experience freezer paper's definitely the best. Wax paper, used in ovens for example, works too, but it tends to absorb some of the ink. The advantage of freezer paper is that it uses a plastic coating, rather than wax, and this means the ink will definitely stay on top of this layer. There are different types of wax paper, as there are different types of freezer paper. The best ones tend to be the higher quality ones. Plastic's also easier to wipe clean, so you can keep using the same sheet over and over again. I used the same sheet for 8 coasters in total.